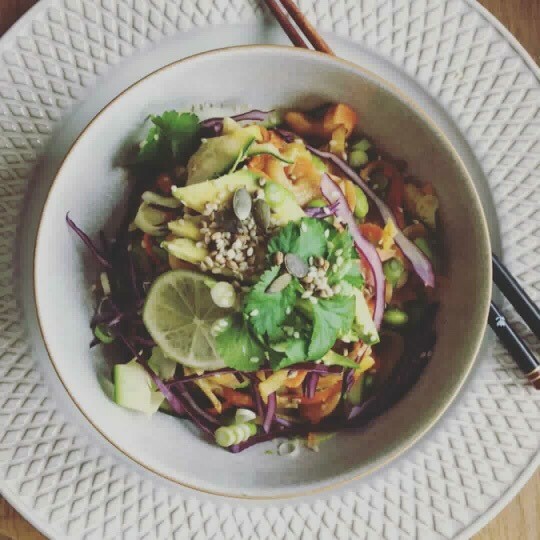 Following The Liberty Kitchen’s pop up in Chapelton, the health food truck company has provided the perfect recipe for summer – an easy, fresh and colourful spicy peanut rainbow vegetable bowl. Great for lunch or dinner and quick to make, this dish is full of flavour but more importantly packed with healthy ingredients. In a blender, combine all of the ingredients for the spicy peanut sauce. Add the water carefully until the desired consistency is reached. Set the sauce aside. Heat a frying pan, add the coconut oil and lightly fry the cashew nuts. Once they are golden, add the edamame beans until warmed through. Add the carrot and courgette for around a minute until warm, these should still have a slight crunch. Remove from the heat and pour over the spicy peanut sauce. Add in the raw red cabbage, divide into four bowls and top with the avocado, spring onions, coriander, seeds and lime. Enjoy!